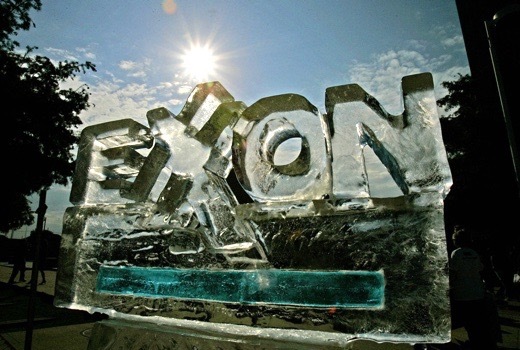 SUBHEAD: A Massachusetts judge has refused to block the climate fraud investigation of Exxon. Image above: An ice sculpture fashioned by protesters slowly melts outside the Exxon Mobil shareholders meeting in Dallas. From (https://thinkprogress.org/50-years-ago-big-oil-bragged-about-being-able-to-melt-glaciers-while-they-knew-about-climate-change-728efe887daa#.6d54cpe8f). Exxon had fought state Attorney General Maura Healey's demand for documents about potential climate fraud, but a Massachusetts judge backs Healey's right to the probe.